The General Electric Company, or GE (NYSE: GE), is a multinational American technology and services conglomerate incorporated in the State of New York. As of September 30, 2008, GE is the world's tenth largest company in terms of market capitalization and also second in the BrandZ ranking. GE began in 1896 as a merger of Thomas Edison’s Edison General Electric Company and Thomson-Houston Electric Company. In 1919, GE founded the Radio Corporation of America (RCA) in 1919, and was a co-founder of National Broadcasting Corporation (NBC) in 1926. In the 1960s, changes in U.S. tax laws and accounting practices led to the emergence of a number of conglomerates. GE is one of the most successful organizations of this type. Though most familiar to the general public as a manufacturer of electronics and appliances, GE derives more than half of its revenue from financial services and is one of the largest lenders outside the United States. One of its subsidiaries, GE Aviation, is the top supplier of aircraft engines in the world. Until the 1970s, GE’s manufacturing plants discharged large quantities of toxic wastes into the soil and water, including as much as 1.3 million pounds of PCBs from its capacitor manufacturing plants at the Hudson Falls and Fort Edward facilities into the Hudson River. GE has been criticized for trying to avoid a clean-up; in 2002, GE was ordered by the courts to clean up a 40 mile stretch of the Hudson River, and dredging will begin in 2009. An "Ecomagination" initiative launched in May 2005 to invest in the development of clean technology solutions resulted in 70 green products being brought to market by October 2008, ranging from halogen lamps to biogas engines. In 1878, Thomas Edison formed the Edison Electric Light Company in New York City with several financiers, including J. P. Morgan and the members of the Vanderbilt family. 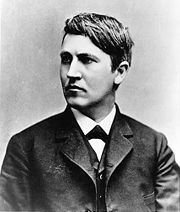 Edison made the first public demonstration of his incandescent light bulb on December 31, 1879, in Menlo Park. During this period he announced: "We will make electricity so cheap that only the rich will burn candles." In 1880, Edison patented an electric distribution system, which was essential if the electric lamp were to be used by the public. On December 17, 1880, Edison founded the Edison Electric Illuminating Company. In 1882, Edison opened the first steam-generated power station at Holborn Viaduct in London to supply electricity for street lamps and several private dwellings within a short distance of the station; and New York City’s first investor-owned electric power distribution system, Pearl Street Station, which provided 110 volts direct current (DC) to 59 customers in lower Manhattan. On January 19, 1883, the first standardized incandescent electric lighting system employing overhead wires began service in Roselle, New Jersey. By 1890, Edison had organized his various businesses into the Edison General Electric Company. In 1879, Elihu Thomson and Edwin J. Houston formed the rival Thomson-Houston Electric Company. It merged with several other companies and was later led by Charles A. Coffin, a former shoe manufacturer from Lynn, Massachusetts. Mergers with competitors and the patent rights owned by each company made Thomson-Houston Electric Company and Edison General Electric Company dominant in the electrical industry. As their businesses expanded, it became increasingly difficult for either company to produce complete electrical installations relying solely on its own technology. In 1892, the two companies combined, in a merger arranged by financier J. P. Morgan, to form the General Electric Company, with its headquarters in Schenectady, New York. In 1896, General Electric was one of the original 12 companies listed on the newly-created Dow Jones Industrial Average. After 122 years it is the only one of the original companies remaining on the Dow, though it has not stayed there continuously. In 1911 the National Electric Lamp Association (NELA) was absorbed into General Electric's existing lighting business. GE then established its lighting division headquarters at Nela Park in East Cleveland, Ohio. Nela Park, the world's first industrial park, was added to the National Register of Historic Places in 1975, and is still the headquarters for GE's lighting business. In 1919, GE founded the Radio Corporation of America (RCA) as an operating company to purchase and use GE's powerful Alexanderson alternator radio transmitters. It was organized as an American monopoly of radio technology to allow the United States to occupy what were then believed to be very limited numbers of radio frequencies before other countries, particularly Great Britain, could buy their own alternators and take the frequencies first. In 1926, RCA acquired two radio stations and launched the National Broadcasting Corporation (NBC), in which GE held a 30 percent stake. General Electric was one of the eight major computer companies through most of the 1960s. IBM, the largest, was nicknamed "Snow White," followed by the "Seven Dwarfs": Burroughs, NCR, Control Data Corporation, Honeywell, RCA, UNIVAC and GE. GE produced an extensive line of general purpose and special purpose computers. Among them were the GE 200, GE 400, and GE 600 series general purpose computers, the GE 4010, GE 4020, and GE 4060 real time process control computers, and the Datanet 30 message switching computer. A Datanet 600 computer was designed, but never sold. It has been said that GE became involved in manufacturing computers because, during the 1950s, it was the largest user of computers outside of the United States federal government. In 1970 GE sold its computer division to Honeywell. In 1986 GE reacquired RCA, primarily for its NBC television network. The other divisions of RCA were sold to various companies, including Bertelsmann and Thomson SA. NBC Headquarters at the GE Building in New York City. The current Chairman and CEO, Jeffrey Immelt took over on September 7, 2001, four days before the terrorist attacks on the United States, which killed two employees and cost GE's insurance business $600 million, as well as having a direct effect on the company's Aircraft Engines sector. In 2002, Francisco Partners and Norwest Venture Partners acquired a division of GE called GE Information Systems (GEIS). The new company, named GXS, is based in Gaithersburg, MD, and is a leading provider of B2B e-Commerce solutions. GE maintains a minority ownership position in GXS. In 2004, GE bought Vivendi's television and movie assets, becoming the third largest media conglomerate in the world. The new company was named NBC Universal. Also in 2004, GE completed the spin-off of most of its mortgage and life insurance assets into an independent company, Genworth Financial, based in Richmond, Virginia. Genpact, formerly known as GE Capital International Services (GECIS), was established by GE in late 1997 as its captive India-based business process outsourcing (BPO) unit. GE sold a 60% stake in Genpact to General Atlantic and Oak Hill Capital Partners in 2005 and spun off Genpact as an independent business. GE is still a major client of Genpact, using its customer service, finance, information technology and analytics services. On May 21, 2007, General Electric announced it would sell its GE Plastics division to petrochemicals manufacturer Saudi Basic Industries Corp. for net proceeds of $11.6 billion. The transaction took place on August 31, 2007, and the company name changed to SABIC Innovative Plastics, with Brian Gladden as CEO. In May 2008, GE announced it was exploring options for divesting the bulk of its consumer and industrial business. GE is a multinational conglomerate headquartered in Fairfield, Connecticut. 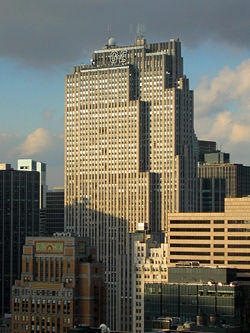 Its New York headquarters are located at 30 Rockefeller Plaza in Rockefeller Center, known as the GE Building for the prominent GE logo on the roof. Through its RCA subsidiary, it has been associated with the Center since its construction in the 1930s. The company describes itself as composed of a number of primary business units or "businesses." Each "business" is itself a vast enterprise. The list of GE businesses has varied over the company’s history as the result of acquisitions, divestitures, and reorganizations. General Electric's tax return is the largest return filed in the United States; the 2005 return was approximately 24,000 pages when printed out, and 237 megabytes when submitted electronically. GE's divisions include GE Capital (including GE Commercial Finance and GE Money and GE Consumer Finance,), GE Technology Infrastructure (including GE Aviation, the former Smiths Aerospace and GE Healthcare), GE Energy Infrastructure, and NBC Universal, an entertainment company. Through these businesses, GE participates in a wide variety of markets including the generation, transmission and distribution of electricity (nuclear, gas and solar), lighting, industrial automation, medical imaging equipment, motors, railway locomotives, aircraft jet engines, and aviation services. It was co-founder and is 80% owner (with Vivendi) of NBC Universal, the National Broadcasting Company. Through GE Commercial Finance, GE Consumer Finance, GE Equipment Services, and GE Insurance it offers a range of financial services. GE has a presence in over 100 countries. 23 Ton diesel electric locomotive made at the General Electric Corp. plant in Schenectady, N.Y.
More than half of GE's revenue is derived from financial services. It is also one of the largest lenders in countries other than the United States, such as Japan. Other conglomerates such as ITT, Ling-Temco-Vought, and Tenneco in the 1980s, and Westinghouse, Tyco, and others in the late 1990s have tried and failed to emulate GE's success. In May 2008 General Electric announced that it would auction off its appliances business for an expected $5-8 billion. On Dec 12, 2008, GE announced job cuts as well as a restructuring of its finance unit, warning that fourth quarter results would be low. GE Aviation, headquartered in Evendale, Ohio (a Cincinnati suburb), is the top supplier of aircraft engines in the world and offers engines for the majority of commercial aircraft. The division operated under the name of General Electric Aircraft Engines or GEAE until September 2005. In 1942, General Electric developed the first US jet engine in Lynn, Massachusetts. The Lynn facility continues to assemble jet engines for the United States Department of Defense, subsidiary services and commercial operators. Engines assembled at this plant include the F404, F414, T700, and CFE738 military power plants. The plant at Lynn also produces the -3 and -8 variants of the CF34 regional jet engine, the CT7 commercial turboprop power plant and commercial versions of the T700 (also CT7). The Evendale plant conducts final assembly for the CFM International's CFM56, CF6, as well as LM6000, and LM2500 power plants. The Durham, North Carolina facility conducts final assembly for the GE90 and CF34 power plants. Crucial parts for these engines are crafted in secondary GEAE facilities, such as those in Bromont, Quebec; Hooksett, New Hampshire; Wilmington, North Carolina; Madisonville, Kentucky and Rutland, Vermont; where the engine blades and vanes are manufactured. General Electric has the fourth most recognized brand in the world. In 2004, changes were made in the presentation of the brand to unify the diversified businesses of GE. The changes included a new corporate color palette, small modifications to the GE Logo, a new customized font (GE Inspira), and a new slogan, "imagination at work" replacing the longtime slogan "we bring good things to life." The standard requires many headlines to be lowercased and adds visual "white space" to documents and advertising to promote an open and approachable company. The changes were designed by Wolff Olins and are used extensively on GE's marketing, literature and website. The value of the brand is reinforced by ownership of two letter domain ge.com, registered on August 5, 1986. General Electric is one of the few corporations worldwide to own a two letter domain name. The brand is also reflected by the GE New York Stock Exchange ticker symbol. GE has faced criminal action regarding its defense-related operations. GE was convicted in 1990 of defrauding the U.S. Department of Defense, and again in 1992 on charges of corrupt practices in the sale of jet engines to Israel. Based on year 2000 data, researchers at the Political Economy Research Institute listed GE as the fourth-largest corporate producer of air pollution in the United States, with more than 4.4 million pounds per year (2,000 Tonnes) of toxic chemicals released into the air. General Electric has also been implicated in the creation of large quantities of toxic waste. According to EPA documents, only the United States Government and Honeywell are responsible for producing more Superfund toxic waste sites. During the 1900s, G.E. used PCBs (polychlorinated biphenyls), a slippery yellowish goo as thick as motor oil that can resist heat without catching fire, at its Hudson Falls and Fort Edward factories on the Hudson to build electrical capacitors and at its plant on the Housatonic to manufacture transformers. Storm water run-off carried large quantities of PCBs into the Hudson and Housatonic Rivers; from approximately 1947 to 1977, GE discharged as much as 1.3 million pounds of PCBs from its capacitor manufacturing plants at the Hudson Falls and Fort Edward facilities into the Hudson River. In 1976, the United States government banned the chemicals because they were found to be neurotoxins and probable human carcinogens. GE fought a media and political battle to avoid cleaning up the Hudson River. In 1983, New York State Attorney General Robert Abrams filed suit in the United States District Court for the Northern District of New York to compel G.E. to pay for the cleanup of what was claimed to be more than 100,000 tons of chemicals dumped (legally, at the time) from their plant in Waterford. In 1999, the company agreed to pay a $250 million settlement in connection with claims it polluted the Housatonic River and other sites with polychlorinated biphenyls (PCBs) and other hazardous substances. GE attempted to avoid cleaning up the Hudson River, challenging the Superfund law in court, and launching an extensive media campaign claiming that the hazardous chemicals would be covered by sediment and that dredging the river would actually stir up PCBs. In 2002, the courts ordered GE to clean up a 40 mile stretch of the Hudson River it had contaminated. GE completed its clean-up of a two-mile stretch of the Housatonic in 2006, and dredging in the Hudson will begin in 2009. In 2003, acting on concerns that the plan proposed by GE did not "provide for adequate protection of public health and the environment," the United States Environmental Protection Agency issued a unilateral administrative order for the company to "address cleanup at the GE site" in Rome, Georgia, also contaminated with PCBs. GE was also the focus of a 1991 short subject Academy Award winning documentary, "Deadly Deception: General Electric, Nuclear Weapons, and Our Environment" that juxtaposed "GE's rosy 'We Bring Good Things To Life' commercials with the true stories of workers and neighbors whose lives have been devastated by the company's involvement in building and testing nuclear bombs. In May 2005, GE launched an "Ecomagination" initiative intended to promote the company as friendly to the environment. CEO Jeffrey Immelt announced that the company would invest in the development of clean technology solutions such as solar energy, hybrid locomotives, fuel cells, lower-emission aircraft engines, lighter and stronger durable materials, efficient lighting, photovoltaic cells, and desalination and water purification technology,” As of October 2008, the program had resulted in 70 green products being brought to market, ranging from halogen lamps to biogas engines. GE is currently one of the biggest players in the wind power industry, with over 10,000 worldwide wind turbine installations comprising more than 15,000 MW of capacity. In 2007, GE raised the annual revenue target for its Ecomagination initiative from $20bn in 2010 to $25bn, following positive market response to its new product lines. The company has set goals for its subsidiaries to lower their greenhouse gas emissions. ↑ General Electric, Our Company. Retrieved February 3, 2009. ↑ 2.0 2.1 GE_PressRelease_US Retrieved February 3, 2009. ↑ Blogging Stocks, GE Slices itself into four parts. Retrieved February 3, 2009. ↑ Bizjournals, GE to Reorganize operations. Retrieved February 3, 2009. ↑ U.S Securities and Exchange Commission, Company Information: General Electric. Retrieved February 3, 2009. ↑ Jonathan Reed, Nexus: Strategic Communications and American Security in World War I (Winkler, Cambridge, MA: Harvard University Press, 2008). Retrieved February 1, 2009. ↑ GE, Jeffrey R. Immelt's Biography. Retrieved February 3, 2009. ↑ New York Times, General Electric to Sell Plastics Division. Retrieved February 24, 2009. ↑ United States Department of the Treasury—Internal Revenue Service, [IRS e-file Moves Forward; Successfully Executes Electronic Filing of Nation’s Largest Tax Return.] Retrieved February 24, 2009. ↑ GE Money Global Financial Solutions Retrieved February 3, 2009. ↑ Nuclear Spin, Spinwatch on GE. Retrieved February 3, 2009. ↑ Saskrail museum, Homepage. Retrieved February 3, 2009. ↑ MSNBC, GE confirms it's exiting appliance business—U.S. business. Retrieved February 3, 2009. ↑ Studio 5, GE To Cut Jobs, Reorganize Finance Unit. Retrieved February 3, 2009. ↑ Network Solutions, Domain Registration Information: ge.com. Retrieved February 3, 2009. ↑ VB, List of Large Companies that own a Two Letter Domain. Retrieved February 3, 2009. ↑ Sam Husseini, Felons On The Air: Does GE's Ownership of NBC Violate the Law? Retrieved February 3, 2009. ↑ New York Times, G.E. Guilty Plea in U.S. Aid to Israel. Retrieved February 3, 2009. ↑ University of Massachuessetts, Political Economy Research Institute Toxic 100 Corporate Toxics Information Project Technical Notes. Retrieved February 3, 2009. ↑ RTKnet, Political Economy Research Institute. Retrieved February 3, 2009. ↑ Public Integrity, The Center for Public Integrity. Retrieved February 3, 2009. ↑ EPA, Hudson River PCBs. Retrieved February 3, 2009. ↑ New York Times, The Region; G.E. Plant Accused Of Water Pollution." Retrieved February 3, 2009. ↑ U.S. DOJ, General Electric agrees to $250 Million Settlement to Clean Up PCBs in Housatonic River. Retrieved February 3, 2009. ↑ NRDC, Historic Hudson River Cleanup to Begin After Years of Delay, But Will General Electric Finish the Job? Retrieved February 3, 2009. ↑ New York Times, Old Questions Linger as New PCB Cleanup Starts. Retrieved February 3, 2009. ↑ EPA, Yosemite. Retrieved February 3, 2009. ↑ New Day, Deadly Deception: General Electric, Nuclear Weapons, and Our Environment. Retrieved February 3, 2009. ↑ World Changing, "Ecomagination: Inside GE's Power Play." Retrieved February 3, 2009. ↑ GE Power, Wind energy at GE. Retrieved February 3, 2009. ↑ Business Green, GE cleantech sales to top $17bn this year. Retrieved February 3, 2009. Carlson, W. Bernard. Innovation as a Social Process: Elihu Thomson and the Rise of General Electric, 1870-1900. Cambridge: Cambridge University Press. 1991. ISBN 9780521393171. Cox, James A. A Century of Light. New York: Benjamin Co. 1979. ISBN 9780875020624. Hammond, John Winthrop, and Arthur Pound. Men and Volts; the Story of General Electric. Philadelphia: J.B. Lippincott Co., 1941. Haney, John L. The Elihu Thomson Collection. American Philosophical Society Yearbook, 1944. Miller, John A. Men and Volts at War; the Story of General Electric in World War II. New York: Whittlesey House, McGraw-Hill Book Company, Inc. 1947. Rothschild, William E. The Secret to GE's Success. New York: McGraw-Hill. 2007. ISBN 9780071475938. Woodbury, David O. Elihu Thomson, Beloved Scientist. Boston: Museum of Science, 1944. This page was last modified on 25 May 2017, at 16:31.